Sturtevant, WI (04/04/16) – This morning, opening day of MODEX 2016, at the Georgia World Congress Center in Atlanta, GA, Ed Brown, founder of Topper Industrial, announced that the company will launch a new division called Topper Tube in Q3 2016. 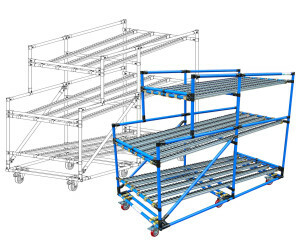 Topper Industrial will add Gravity Flow Racks and Tubular Workstations to their line of material handling products. Topper Industrial makes gravity flow racks and work stations, industrial cart, containers, delivery systems, lift and rotate systems, conveyors and racking. Topper Industrial is the only company nationwide to manufacture all products needed to move material from the dock to the cart; from the delivery system to the line. Topper Industrial is exhibiting at MODEX 2016, the largest expo for the manufacturing and supply chain industries from April 4-7, 2016. Attendees visiting Topper Industrial at booth #647 will learn about fork truck free material handling equipment. The MODEX Supply Chain Conference brings together leading experts from the industry to give the latest information on manufacturing and supply chain trends, technologies, and innovations. The conference also includes valuable opportunities to network with industry leaders.